Domes are used in a high variety of buildings, such as palaces, shopping centres, theatres, universities or private villas of Turkish or Byzantine architectural inspiration. 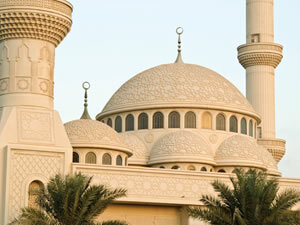 However, its major use is in mosque construction, which accounts for 90% of dome utilisation. Precast domes can be produced using several production techniques: traditional precast, glass-fibre-reinforced concrete (GRC) or glass-reinforced polyester (GRP). Although the production cost is lower in traditional precast, it is preferable to use GRC or GRP production technology whenever the diameter of the dome exceeds 20m in order to limit the weight of each dome segment or in the case of a patterned dome. When the domes are covered with decorative patterns on both sides, as is the case for the Saif Bin Darwish mosque, the GRC external structure is fitted with a GRP internal layer fixed on-site by mechanical fixings. The moulds used for the production of traditional precast segments are generally made of steel. Based on the curvature profiles of the design, wood templates are prepared for different directions. Steel channels are bent in both directions and welded together at a spacing of 400–600mm. The wood templates are used to verify that the channels perfectly match the required curvature. Small strips of steel plate are then welded on top of these channels at decreasing angles. The welded joints between the steel plates are then ground until the surface of the mould is perfectly smooth and at the required curvature. For further control, every element produced is checked against the wood templates. However, for GRC and GRP segments the mould manufacturing technique is quite different, as it consists of a wooden countermould on which a GRP mould is cast. GRC or GRP segments are then produced within the GRP mould or a rubber mould when the pattern is highly intricate. In the United Arab Emirates, with the enhanced Government policy for sustainable development and the use of Estidama and LEED Standards, a new requirement in dome production has recently emerged, namely the need for double-skinned insulated large domes that meet the required U value of 0.26W/m2K or less. Here, layers of insulation are incorporated within the dome segment. Depending on the size of the dome, the traditional precast technology or GRC technology is adapted to this additional requirement. Gulf Precast is currently producing 36 domes for the Presidential Palace development in Abu Dhabi, the largest of them with double-skinned insulation, while the smallest are fitted after erection with separate insulation from the inside. The diameter of some of these domes reaches 36m. While 29 of the smaller domes can be produced in traditional precast, seven of them are produced in GRC to obtain lighter segments. The largest of the domes comprises 109 GRC pieces fitted together on-site, supported by a separate steel structure. Once installed, the domes will be covered on the outside by 8mm of ceramic tiles. This implies that the tolerance on the GRC segments cannot exceed 2mm. To meet the stringent insulation requirements, a first 20mm layer of GRC is cast, upon which 100mm of Rockwool and 50mm of polystyrene are placed. A connection system made of insulated reinforcement bar trusses is then placed in the mould and a second layer of 20mm of GRC is then cast on top. The dome segments are then brought onsite and fitted together. In the case of traditional precast domes, the segments are generally fixed on a cast-in-place ring beam and then grouted together using in-situ concrete strips between the segments. For GRC segments of patterned domes or large domes, segments are mechanically fixed. For large domes with segments fixed at different levels, such as the 109-segment dome of the Presidential Palace Abu Dhabi, a central scaffolding tower is erected below the dome to support the elements during the installation period. The top central piece is fixed at the end and used as a key that holds all segments together. The tower scaffolding is then no longer required. While producing and erecting precast and GRC domes requires experience and know-how, it is often the best solution when stringent tolerances are required, such as the 2mm maximum tolerance for the Presidential Palace imposed by the intended fixing of ceramics on the outside of the domes. Strict quality assurance and control throughout the construction process is required to ensure that all the assembled pieces will meet this requirement. 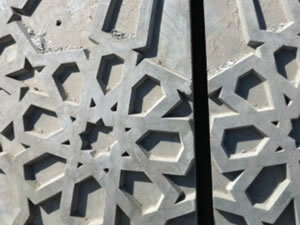 The same applies when the requirement is for a highquality finish and intricate patterns.